I am so excited that Cinderella is coming out on Blu-ray/DVD but I am even more excited that I have a reason to throw a party for a bunch of little girls. I am just a big kid anyway! So if you haven't heard Cinderella will be available to purchase on October 2, 2012. This is the first time it is on Blu-ray and will have bonus content, so make sure you pick it up. There is also the awesome new Royal Ball app for Android, iPhone and iPads. If you want to download the app, you can find the QR code for on Walmart's website or on the Cinderella display inside Walmart. Once you have started playing you will need to go on somewhat of a scavenger hunt for more QR codes to find things that go along with the app. 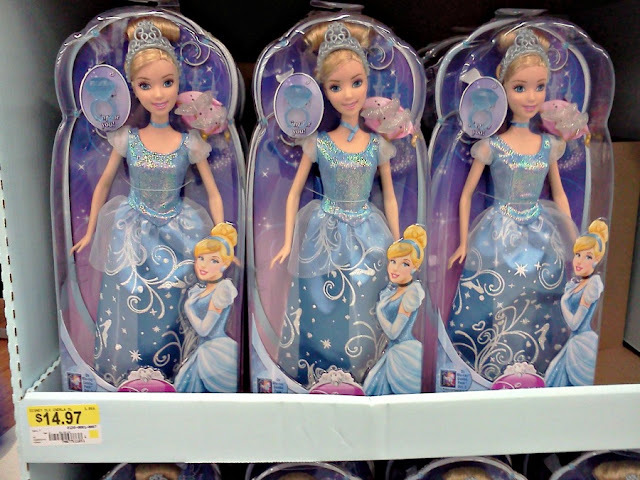 These codes can be found throughout Walmart on certain Cinderella products. This is a picture of some of the game, I tried to take a photo of it on my phone but the photo wouldn't come out right. As you can see you will need to visit Walmart like it says to unlock more items in the game. I went shopping at my local Walmart for my party and looked for the codes but they weren't up yet, I am sure they will be on October 2nd though. Before my Cinderella party we will be attending a Cinderella Retailtainment Event on October 6th from 11am-3pm. Contact your local Walmart as this is at certain locations. You can go dressed as your favorite Disney Princess too! 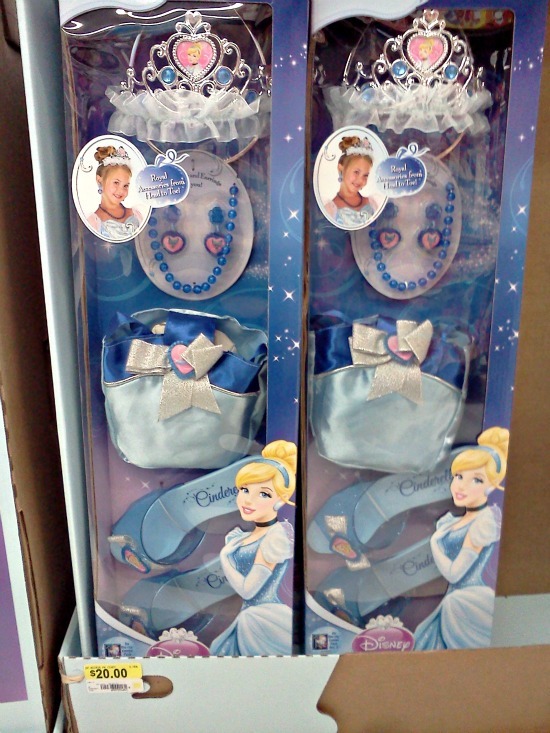 There was a cute Cinderella display that was filled with Cinderella products. You can look here for my entire shopping experience. I especially liked this pack. There is every accessory you would need to be Cinderella! And look at these. I have decided that my daughters need at least one of these Cinderella dolls, they are just adorable! There were so many Cinderella products I was all Cinderella'd out by the time we were finished shopping! 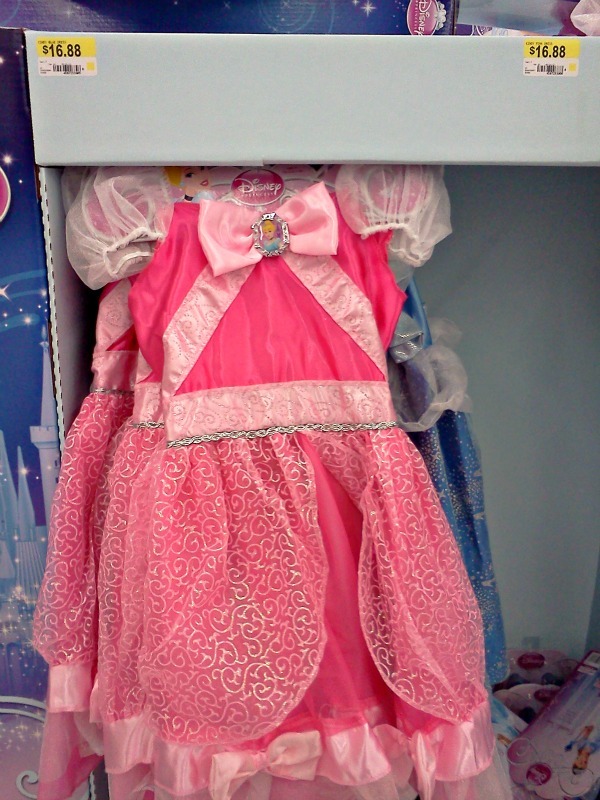 But my daughter picked out a Cinderella costume, this is the one I wanted her to get. I thought it looked beautiful and I know it would she would make it look even better since she is so pretty. She choose the blue Cinderella costume though. Here she is wearing it, this is not how she will look the day of the party, this was just a dress rehearsal. Unfortunately she did not like it, she said it was too itchy all over. So either we are exchanging it for the one I like or trying to find a different blue one. I am guessing we will be looking for another blue dress. Now you can follow Disney on Twitter, Cinderella on Facebook or all the Disney Princesses on Facebook! I loved the pink dresses as well! We also found the sleeves to be a little itchy, so I am going to line ours before the Walmart event. Your daughter looks adorable in her dress! Looks like you had so much fun! Such a bummer about the itchy dress. We got a darker blue version from the toy section which has had no complaints so far.